The Friends House Restaurant, winners of the Community Award at the Food Made Good Awards, has been congratulated by PKL, Britain’s leading temporary and modular kitchen infrastructure supplier. The restaurant won the prestigious award, which was sponsored by PKL, at the 2017 Food Made Good Awards, the Sustainable Restaurant Association’s annual celebration of sustainability and good restaurant practice. The Friends House Restaurant, based the at the central offices of the Quakers in Britain on London’s Euston Road, worked with the Douglas House Project to establish a social enterprise bakery for men with personality disorders. PKL's Ciaran Vaughan attended the awards ceremony on October 4th at the Royal Horticultural Society’s Lindley Hall in London and presented the award with the SRA's Vice President, (and new star of Bake Off), Prue Leith. 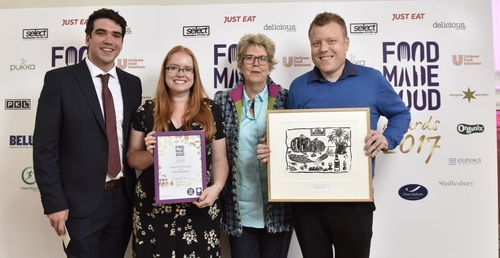 PKL Chief Executive Lee Vines congratulated the Friends House on their win and the Food Made Good Awards for promoting good practice and inspiring the next generation of caterers. “We were delighted to support such a fantastic award, and warmly congratulate the winners,” he said. “Their work helps men with mental health issues and vitally raises awareness of the struggles men in their position can face. Using training of this kind to help give them structure and inspiration is both clever and sustainable and we applaud everything they are doing. Picture shows Ciaran Vaughan (left) with the Food Made Good Community Award winners Friends House Restaurant, SRA President Raymond Blanc and Vice President Prue Leith.